Project: Amelia volunteered at Family Table, the largest Kosher food pantry in New England, once per month for six months. Not only that, she brought a group of friends with her! She says, "It is extremely satisfying to help people in such a hands-on and immediate way. We also had a lot of fun! I would recommend helping Family Table in any way you can. Whether it is donating food here at Temple Shalom (see the baskets at the two entrances) or volunteering your time, it will make a difference." Lia Merkowitz volunteered at Open Door Foodbank, located in Gloucester, MA. She helped to prepare, serve, and clean up after a meal for about 40 people in need. In addition to serving meals, Open Door gives away food grocery-store style. Alice helped with the High Holiday food drive, both Temple Shalom and then at the Newton Food Pantry. 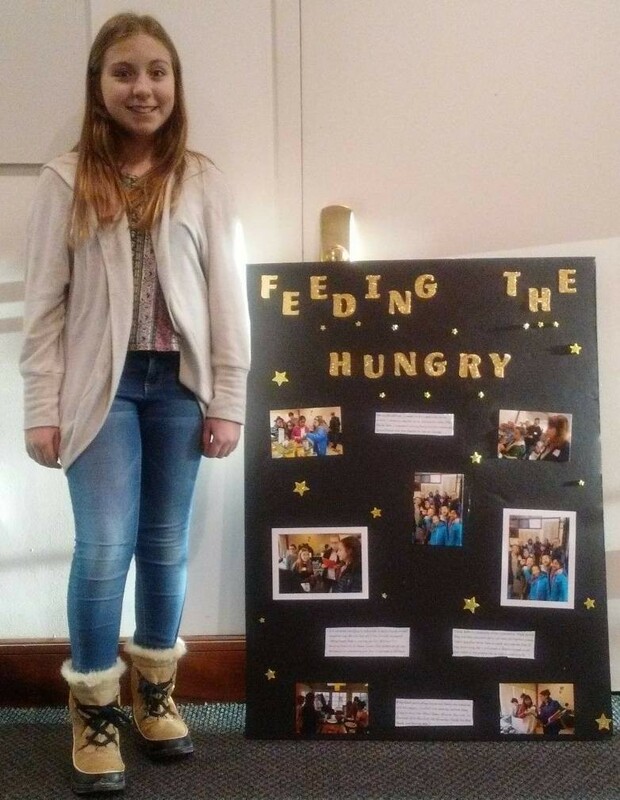 She then created an opportunity to feature the Newton Food Pantry at the Mitzvah Mall, created the display and helped explain the work of the Food Pantry and the challenges of hunger in Newton to visitors at the Mitzvah Mall, helping to raise money and awareness for the Food Pantry. Marcelo volunteered for Boston Gleaners, which is an organization that distributes high-quality, locally grown produce to food banks, pantries, and meal programs by working closely with farmers, providing volunteer labor to harvest what would otherwise be plowed under. Marcelo and his mom picked about 500lbs of apples that go to local food pantries in and around Boston to give families/individuals fresh apples. Marcelo says that it was amazing to see all those apple trees and it was sad to learn that because they do not get enough volunteers that often the apples go without being picked! One Bar Mitzvah and his parents volunteered at the Pine Street Inn, which is a homeless shelter in downtown Boston. He says, “We prepared and served dinner to 146 homeless women who wouldn't have had a meal unless someone helped them.” Pine Street Inn has many different programs and services such as a shelter and job training.